When I started designing the Birthday Party Dress, I wanted to create something versatile that could be dressed up for weddings, parties, and other special occasions but that could also be made for everyday wear. With this pattern you can do both. It all depends on the fabrics you select. But before I get into the possibilities that fabric choices offer, let me tell you a little about the dress. We rated this pattern as three of four scissors for difficulty level. It’s not our easiest pattern, but I wouldn’t really call it difficult either. It’s just that all of the garment’s interesting details involve more steps than most of our patterns. Of course, it all pays off in the end. And, as always, we walk you through the process in our detailed instructions. If you work through each step carefully, you’ll be amazed at what you can achieve. The dress itself has three box pleats down the center front. These pleats can be pressed to sharp creases or left soft for two different looks. 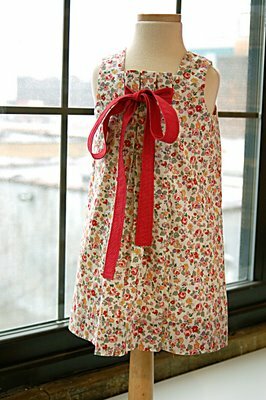 The dress also provides the option of finishing the front with an assymetrical tab (my favorite) or a soft bow. 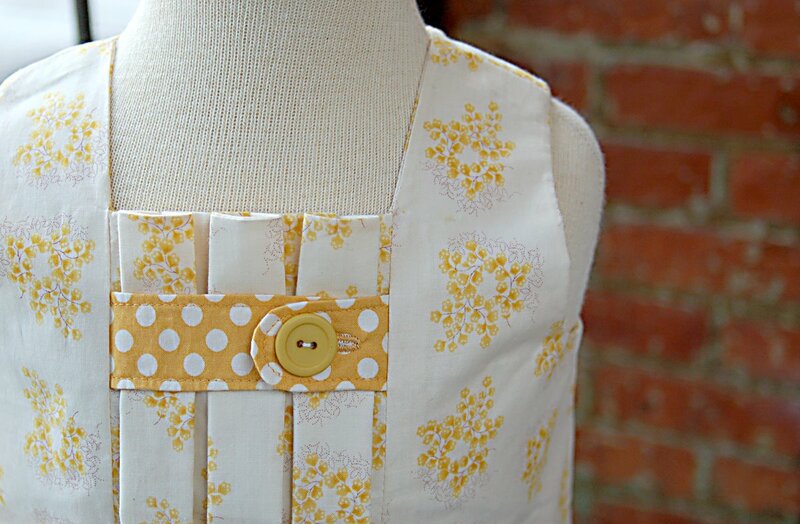 The dress buttons up the back, which I think is the nicest way to finish a dress of this sort. Some dainty vintage buttons would look great here, as would simple mother-of-pearl (my stand-by for most occasions). And, of course, we included our signature hem facing, which gives lots of fun options. 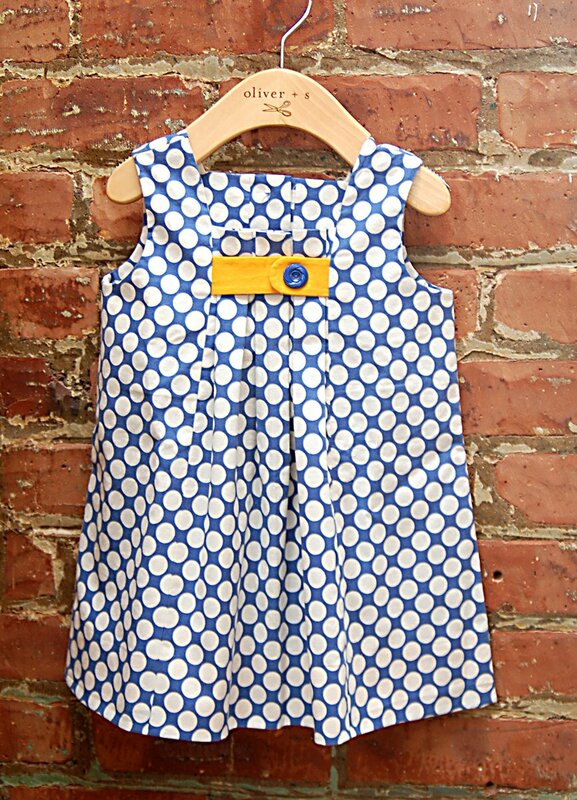 Do you remember this blue and white polka dotted Birthday Party dress with the orange tab? Well, it’s got an orange hem facing, too. How fun to catch a glimpse of that as your daughter dashes past you at the playground. 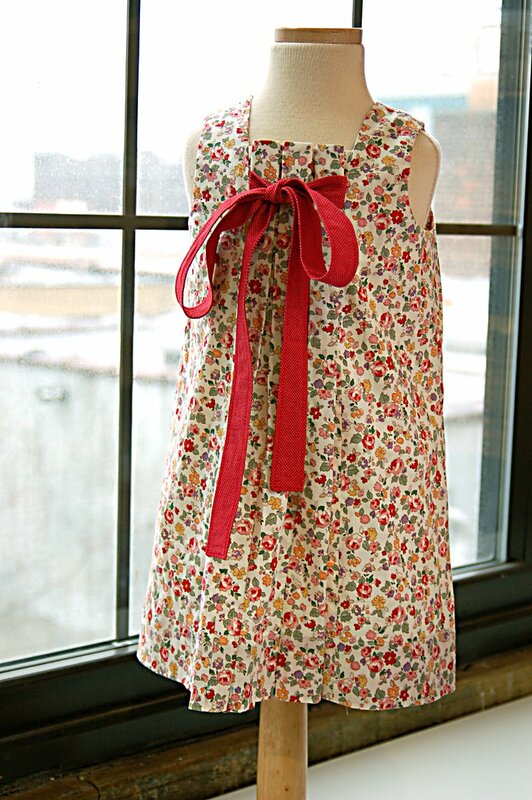 Sewn with the bow option (view B on the pattern envelope) and made in silk dupioni, this would be a perfect flower girl dress. In fact, my little sister is getting married in September, and this may be the dress that S and her cousins wear for the event. It would also be gorgeous in linen (I found a metallic linen the other day which I’m also contemplating) or in a Liberty print. This week we’ve been playing the width of the tie in the studio. If you make it wide it gets really poofy and party-ish (is that a word?) You could use a ribbon for the tie, instead of fabric, if you prefer. I was up at Tinsel Trading on Saturday and found an amazing vintage moire grosgrain. (It’s being used for an Easter dress I can’t wait to show you. ) They also had the most luxurious silk satin ribbons in spectacular colors and a wide variety of widths, if you really want to go all out. Easter is just around the corner, after all. As you’ve seen with the Moda fabrics we used, the Birthday Party Dress looks equally appropriate in printed cottons and worn as a more casual everyday dress. Not only is it cute with a single fabric for the dress and a little pop of complimentary or contrasting fabric for the tab or tie, but I like the idea of color-blocking the pattern as well. You could do the center pleated panel in one fabric (maybe a tiny floral), the tab or tie in a second fabric (a solid color, perhaps), and the rest of the dress in a third (perhaps a medium-sized coordinating print). This design provides endless possibilities. I can hardly wait to see what you make from the pattern. So far each version of it that we’ve made in the studio and for trunk shows has taken a completely different look depending on the fabric we used. I’ll be showing you some other versions of the dress in the next days and weeks. I know you’ll make amazing things from the pattern, too. I can hardly wait to see them start appearing in the Flickr group! 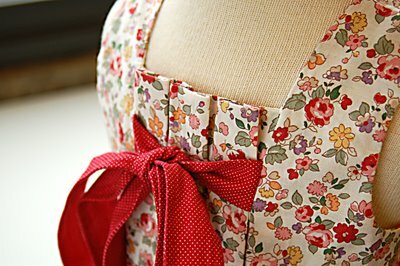 The birthday dress is truely one of my favourites among your many gorgeous patterns. I just adore the effect on the front – it gives the dress an elegant look. And the square neckline is great! This is my favorite of all the patterns. I cannot wait to get mine! Mine are on their way…I can’t wait to CREATE! Thanks for your inspiration. I ordered my Birthday Dress the other day and I can’t wait to get it! This is such a gorgeous pattern! I love how simple it looks from afar, and how beautiful the details are from up close. Lovely! Most gorgeous as usual. Thank you So much for making beautiful clothes like this for the anti-mall girls! I love the floral with the dotted bow – I think you said it was a lawn, right? I love that fabric – so, so, so pretty! What a great dress! Where did you get the navy and white polka dot fabric? I’ve been searching for something like that! I love the patterns for spring and summer. I am in the process of ordering some fabric to make coordinated outfits for my daughter's birthday's this summer. I can not tell you how much I love the post with the swatches of fabric. I would love to see more of those. I am going to order of few of those from B&J; fabrics. 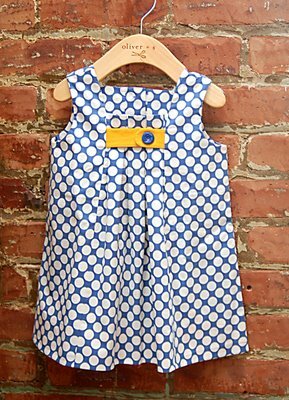 Can you also tell me what fabric you used for the blue polka dot birthday dress in this post. I want to make that with a red tab. Thank you. So simple, and so beautiful. What a wonderful pattern. Thank you.